The Argentinian band Exterminio was rather ‘popular’ in their home country during the nineties, with inclusion of some well-acclaimed demo tapes. At the end of last century they did split up, but in 2006 they reformed. 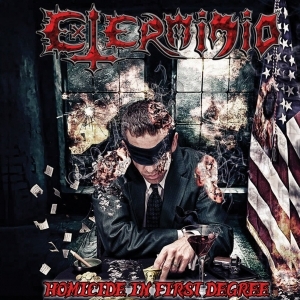 In 2007 Exterminio released their debut full length, Homicide In First Degree (via Hurling Metal Records), and in 2012 the second one, Inhuman Atrocities, via Icarus Music. At the very end of last year, Rebirth The Metal Productions and Grindhouse Music decided to join forces in order to re-release the band’s 2007-full length, which was recorded, mixed and mastered at the Virtual Studio in late spring and summer 2007 with Juan Pablo Hernandez and Lörihen guitarist Emiliano Obregón (Acid Rain, Levas, Kamikaze, Traetormentas, Matan S.A. etc.). This new edition of Homicide in First Degree comes with two (truly excellent – they might be the highlights of this re-issue???) bonus tracks, resulting in a total running time of forty minutes (for sixteen titles). It’s a collection of gore Death Metal and deadly Grindcore hymns with all ingredients that characterize this specific trend: blood, gore, torture, horror, filth, mutilation, hate and splatter. Indeed, it means a lack of originality, but let’s admit: does the Grind-scene need a renewing trend? Indeed, it does not, and why should it anyway. With exception of just a handful of acts, I do not know that much Grind-combos that try to be ‘original’ at the one hand, and succeed to convince me at the other. They need to stick to the origins, because Grindcore is a primal sonic outlet. Exterminio are able to express those elementary details that made (and still make) this specific genre so attractive (or repelling, if you want to). I did mention ‘blood’, ‘gore’ and more nice elements in the former paragraph, and this band indeed succeeds to maintain those origins. Yet at the same time, it also implements a total lack of originality. This band truly adds about nothing extraordinary to the overcrowded scene, and that’s a pity. …especially because there is not that much extraordinary within their performance. No, Exterminio are not a dull band at all, but they do not shake our globe either (besides being extremely nasty). But then again, the fabulous sound quality and the sublime performance and grandiose attitude … I think that ‘true’ Grind-adepts must search for this stuff, but the average fan of extreme Music needs to think and listen twice. …own risk!